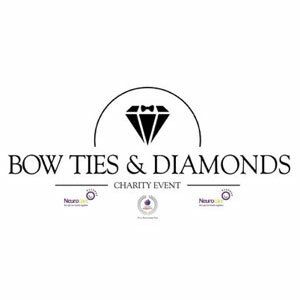 It gives us great pleasure to announce that on the 18th of May 2019 a long time supporter of our charity Matt Hall will be hosting an evening of Bow ties & Diamonds at the Niagara Conference Club, Sheffield. The event is to be held in the exquisite Marquee in the grounds of the club and will be in aid of two local charities ourselves Sincere Support and Neurocare. 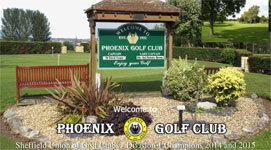 Tickets are £25.00 per person and include entrance, hot buffet, disco, raffle & auction. Time 7pm to midnight, dress code formal (Bow ties and dresses). Sincere Support is delighted to announce the "FINALE" to the trilogy of "An audience with Richie Alexander" shows. For one final time Richie will be answering questions from the audience which includes friends from far and wide and all over the world, singing special song requests personal to the people who will be joining us on this very special occasion. 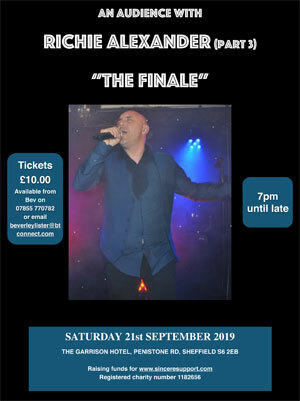 The show will take place on SATURDAY 21st SEPTEMBER 2019 at the Garrison Hotel, Penistone Rd, Sheffield S6 2EB. Tickets are priced at £10.00 per head and are available now from Bev Lister at Sincere Support on - 07855 770782 or email info@sinceresupport.co.uk. The previous to shows have been amazing so please get your tickets now as they are definitely at a premium and availability won't last long.